Do you struggle with portion size control? Do you still feel hungry after you’ve eaten a full meal? Gastric Sleeve Surgery will work to help you feel satisfied with less food and help you lose weight. Your appetite will be reduced because of the reduction of hunger hormones that occurs with surgery. Laparoscopic Sleeve Gastrectomy Surgery is also know as Sleeve Gastroplasty, Tube Gastroplasty, or Tube Gastrectomy. The “lap sleeve” or “gastric sleeve” allows you to eat less more readily. Losing weight and eating less with a sleeve occurs partially because: (a) you’ll have a smaller stomach size after lap sleeve surgery and (b) your appetite is reduced due to the hormonal changes that occur with surgery. You want to eat less in order to lose weight. With a sleeve, the stomach holds LESS volume; therefore you consume less food volume and far fewer calories, resulting in weight loss after surgery. The sleeve gastrectomy (“gastric sleeve”) is a key hole surgery performed on the stomach. A gastric sleeve is a portion-restrictive procedure. It does not involve any surgery on the intestine, which would make it malabsorptive. Sleeve gastrectomy has also been called tube gastrectomy and vertical sleeve gastrectomy. The Sleeve Gastrectomy (SG) removes three-quarters of the stomach, which provides for quicker satiety (sense of fullness) and decreased appetite. The smaller stomach sleeve restricts food intake by allowing only a small amount of food to be eaten at one time. The valve at the outlet of the stomach remains which provides for the normal process of stomach emptying. Also, the sleeve does not involve rerouting of the intestine, hence there is no malabsorption or dumping syndrome. The Sleeve Gastrectomy is believed to have an advantage over the Adjustable Gastric Band due to removal of the part of the stomach that produces the hormone (Ghrelin) which controls the desire to eat. This operation is the most recent advancement in weight loss surgery. It is also known by many other names including Tube Gastrectomy It involves removing two thirds of the stomach and is not reversible. It usually achieves more than 75% excess weight loss. Over 80% of obesity related conditions improve or resolve. It lies between the gastric band and bypass with regards weight loss, surgical risks and complexity. 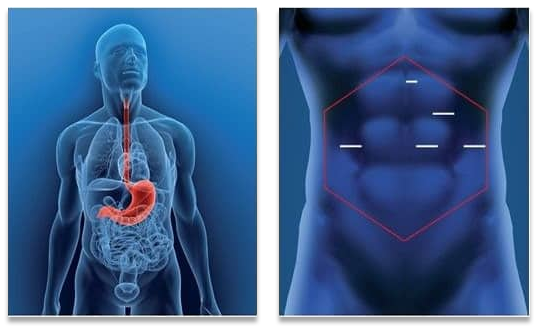 The entry and exit points of the stomach are the native parts (gastrooesophageal junction and pylorus), which makes eating Laparoscopic Sleeve Gastrectomy a new version of stomach stapling for weight loss feel more natural than with the other procedures. The lifestyle and eating style changes needed to maximise the results of this operation are less. It can be converted into a bypass operation if required for further weight loss but this is rarely required. The weight loss achieved is partly due to a smaller stomach and less hunger. Patients do not experience “dumping” (feeling unwell if certain foods such as fats and sugars are eaten) mal-absorption or excessive weight loss, each of which can occur in bypasses. The Sleeve has the most natural eating style. People who have a Sleeve eat just like they do before the operation but in much smaller amounts, eat more slowly and need to chew well. Bands, however, give a restricted feeling and potential for blockages when eating, and bypasses require avoiding certain foods to prevent dumping, malabsorption symptoms and malnutrition. Your stomach after sleeve ‘gastric sleeve’ surgery simply cannot hold anywhere near as much food initially. The volume of food you can eat does increase with time after surgery; however, it does not return to the previous volume. Reduced capacity to consumer calories results in significant weight loss for patients who follow the proper post-surgery nutrition requirements. As with all weight loss surgeries and people who want to change their bodies and their lives, patients need to learn to manage daily stress and adopt a healthy lifestyle that also involves regular exercise and adequate water intake. The stomach holds food and when a meal or drink fills it up it starts stretching and we call this feeling satiation or “I am full”. The Sleeve decreases the amount of food the stomach can hold and therefore what can be eaten. Over time, the stomach does not enlarge and so fullness continues to occur early in a meal. Five small (5 to 15mm) incisions are made in the wall of the abdomen and instruments introduced through them. The inside of the abdomen can then be visualised and the stomach carefully separated from the surrounding structures. Two-thirds of the stomach is removed by passing a stapler up along one side, with a bougie (or tube) inside the stomach to ensure it is the desired size. This creates a tube shaped or sleeve shaped stomach. Quite often there is a slight distortion of the stomach (Hiatus Hernia) near where the Sleeve is to be made. If you have a Hiatus Hernia, this is often repaired during your weight loss surgery gastric sleeve procedure. Pic 1: Highlighted stomach in the upper abdomen. Pic 2: White Lines indicate the five usual incision sites. The Gastric Sleeve/Sleeve Gastrectomy operation takes approximately 60 minutes, however this can vary from patient to patient. Most patients stay in the hospital for 2 days after the gastric sleeve surgery; returning to work after 2 weeks of healing and recovery (convalescence). Every patient needs to make their own choices after getting information on the weight loss surgery options that may provide the best results. However, it can be helpful to know WHY individuals choose the Gastric Sleeve Surgery when they have been unable to lose weight by more conservative methods. Patients who select Gastric Sleeve surgery tend to be individuals who are worried they are not going to be able to attend follow up appointments. Perhaps they live too far away, have very busy lives or many obligations that would make frequent visits to their Surgeon’s team a bit more challenging. People who don’t think they will be able to follow ALL of the required post-weight loss surgery eating rules & lifestyle changes of alternative surgery options for weight loss may also elect to get the lap sleeve (if good candidates for gastric sleeve surgery). People who have a so-called “sweet tooth” and emotional eaters may also find the Gastric Sleeve a more reliable surgery option, in general, compared with the Gastric Band or “lap band” procedure. The Gastric Sleeve surgery is probably the simplest of the weight loss operations to live with, for select patients, over the long term. Why is it a Good Option for Some? A Sleeve Gastrecomy procedure significantly decreases how much can be eaten at any given time, no matter WHAT foods are chosen. Therefore this operation may be popular with “social eaters” and “all-night-eaters”. Laparoscopic Sleeve Gastrectomy surgery can be very effective. However, it is important to consider the other surgery options for weight loss, namely Gastric Bands and Gastric Bypass. Information sheets including A Guide to Weight Loss Surgery are available. This brief information sheet is best considered a reference to be used in conjunction with discussions with your Melbourne Weight Loss Surgeon. To discuss weight loss surgery including Laparoscopic Sleeve Gastrectomy surgery with Dr Arun Dhir and his Bariatric Surgery team in Melbourne, please talk to your GP and obtain a Specialist Referral. Everyone asks if Gastric Sleeve surgery is effective for weight loss. This Sleeve Gastrectomy or gastric sleeve operation is rapidly increasing in popularity in Australia. It sits between lap band surgery and gastric bypass surgery, with respect to the amount of weight loss that is typically achieved for patients. Although only recently available in Melbourne and Australia as a whole, there is ever increasing evidence that gastric sleeve surgery is reliably effective – very effective for patients who are motivated and willing to follow the recommended eating plans after weight loss surgery. After the first 3 to 6 months, most patients find the weight loss and weight management quite straightforward. Hence, follow-up after weight loss surgery involves many less appointments for a gastric sleeve when compared with other weight loss operation options. If you choose this surgery, whenever you need some additional support, you can just call on our team. We have a full range of weight loss support professionals and options to help you get the best in patient care for success after weight loss surgery. Ask us for our FREE e-book about how to stay healthy and eat properly after Weight Loss Surgery. For any operation there are risks. It’s important you are well-informed and understand the benefits and risks of any weight loss surgery operation. The overall risk of major complications from this weight loss surgery is around 2%. The risk of a wound infection after laparoscopic gastric sleeve is approximately 5%. The most common major complication after gastric sleeve surgery is a leak from the staple line. This occurs in around 1 to 2% of patients. Gastric leak development is strongly linked with cigarette smoking. To reduce your risk of developing this complication, you need to quit smoking. ”Eating Squeezing” is an unpleasant feeling that occurs in some people after gastric sleeve surgery. It involves being barely able to eat much food, due to a squeezing sensation whenever food is swallowed. Fortunately, this tends to resolve for most patients after a few months. Patient risks can vary. The most common outcome for surgery is no complications; or a minor problem that will pass, such as a treatable wound infection (5%). When to contact us, if you have a concern after your gastric sleeve surgery.